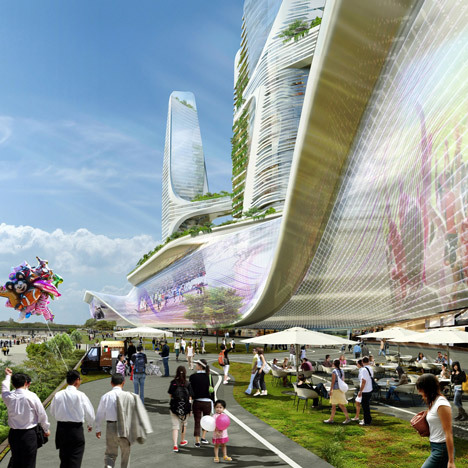 The design of UNStudio’s CBD development is a dynamic composition created by introducing asymmetry in plan, orientation, clustering and façade treatment. This build-up of asymmetries has a far-reaching urban effect whilst simultaneously relating to users on a more personal scale. 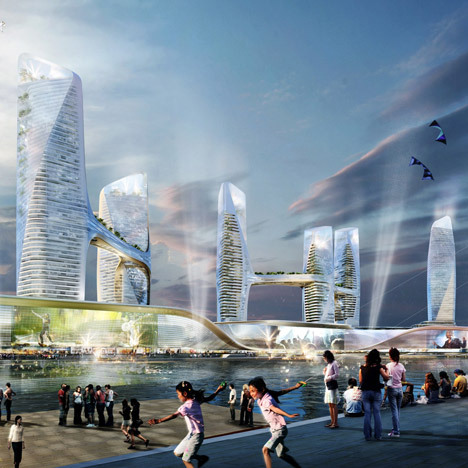 The six towers form three lively groups which interact according to a layered choreography. In relation to the ground and subterranean levels the towers are grouped in three pairs, each standing on a joint platform. As defined by the bridging connections between them, the towers are grouped as a couple, a trio and a single volume. The silhouette of the towers is derived from a combination of substantial differences between the lower and the upper parts of the buildings and the binding together effects of diagonal wrappings. On the lower parts the towers are marked by dense stacking, whilst towards the top they become smooth and reflective. This textural contrast is mediated by the strong diagonals running the entire length of the towers. The bridges have numerous roles. They help to cluster the towers and to form interconnections between them which can house many different semi-public functions. They also provide an artificial ground for users of the highest floors. 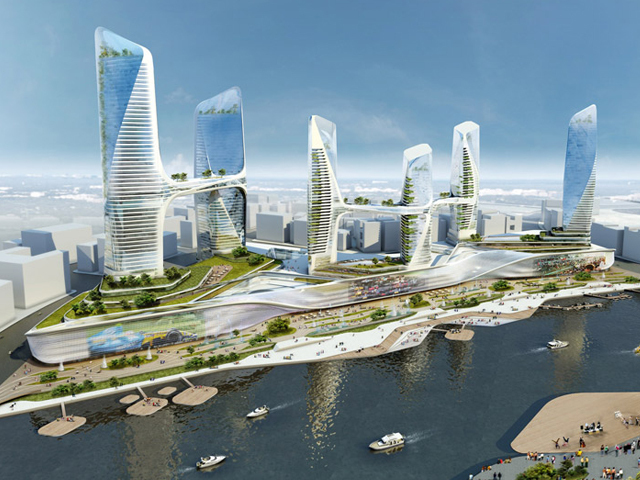 In addition to the application of active sustainable measures at different scale levels, passive design tools were incorporated from the initial design of the six towers and the podium clusters. Driving features are the winter gardens and green surfaces.